I had the immense pleasure of taking a day off work last Tuesday, which gave me the chance to wander around Paris on a weekday and check out a place I have wanted to try for a while now: Bob’s Bake Shop! This American eatery is located in the new, eco-friendly Halle Pajol (which totally deserves its own blog post…I will eventually get around to it), giving it a very unique and natural feel. 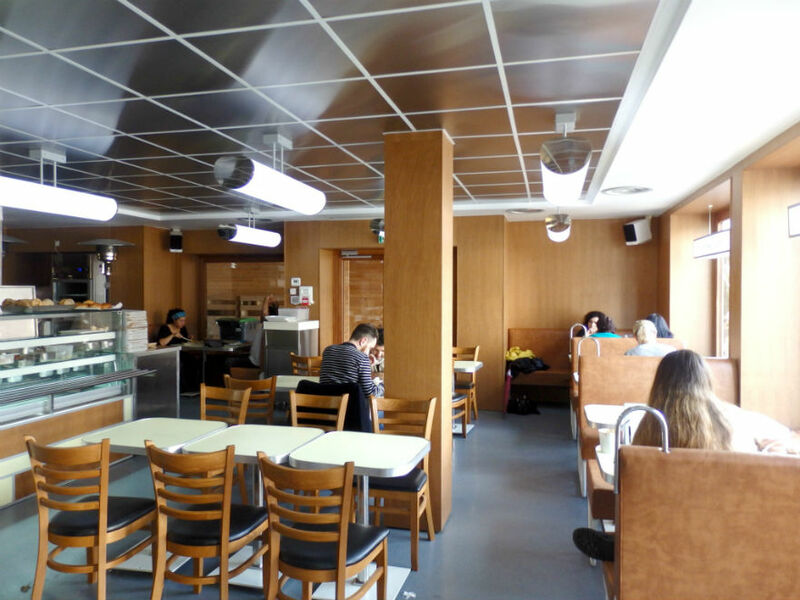 It has a definite North American diner look and the staff speak English and are all casually dressed in loose sweatshirts and beanies, reminding me of coffee shop staff in Vancouver or Seattle. 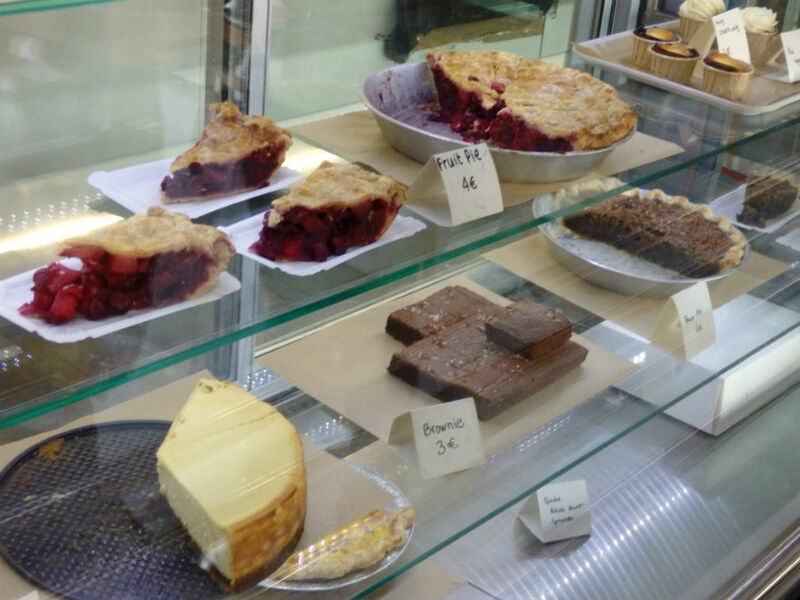 As soon as I walked inside, the smell of freshly ground coffee (from La Brûlerie de Belleville) drifted into my nostrils while my eyes were drawn to the glass display cases full of good old-fashioned pies, cheesecakes and brownies. I was hungry and craving a bagel so I looked up at the wide choice of homemade bagels and the list of possible ingredients to fill them with. I was tempted by the Kalamata olive, feta, and grilled vegetable filling (7 Euros), because feta is the best thing ever!! 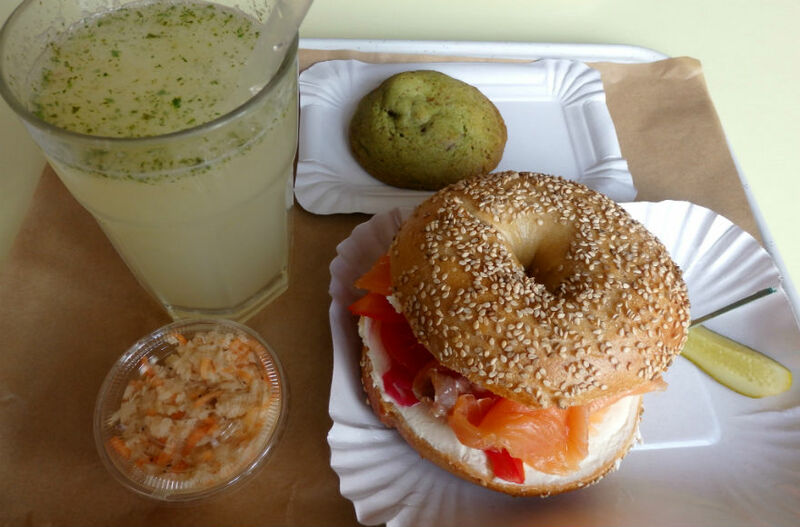 !, but instead chose a classic smoked salmon and cream cheese bagel (8 Euros) from the list of delicious lacto-ovo-pesco vegetarian choices. I equally asked for a fresh mint infused lemonade (3,50 Euros) and a matcha and chocolate chunk cookie (2 Euros) from the pile that were strategically placed on a plate along the counter by the till (it is not possible to resist taking one). Then I sat down by the window at a little table whose color matched my mint lemonade and waited for my bagel to be brought over. 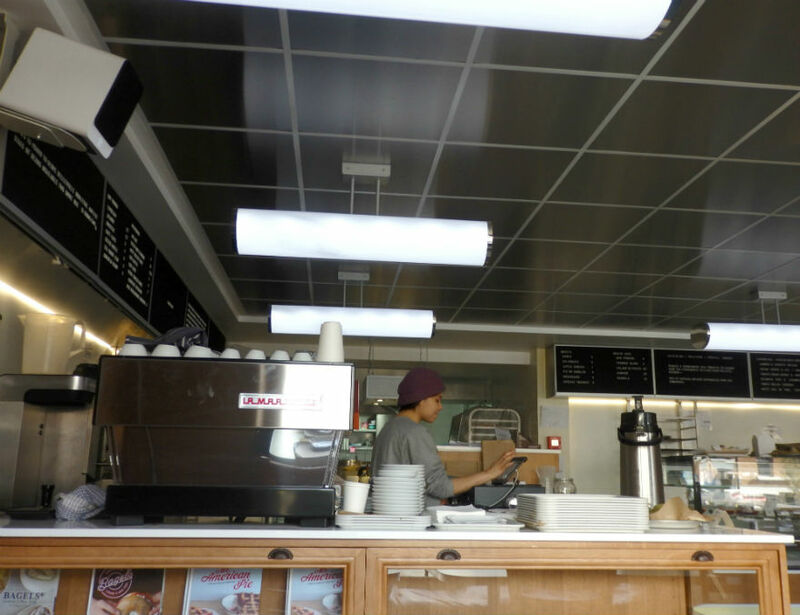 From my cozy corner I looked around as soft folk/pop songs like Angus and Julia Stone “Big Jet Plane” played over the noises of milk frothing and ceramic cups clinking from behind the counter. They have an impressive list of other lunch choices available such as salads, soups, tartines, fresh fruit juices and even chia pudding! 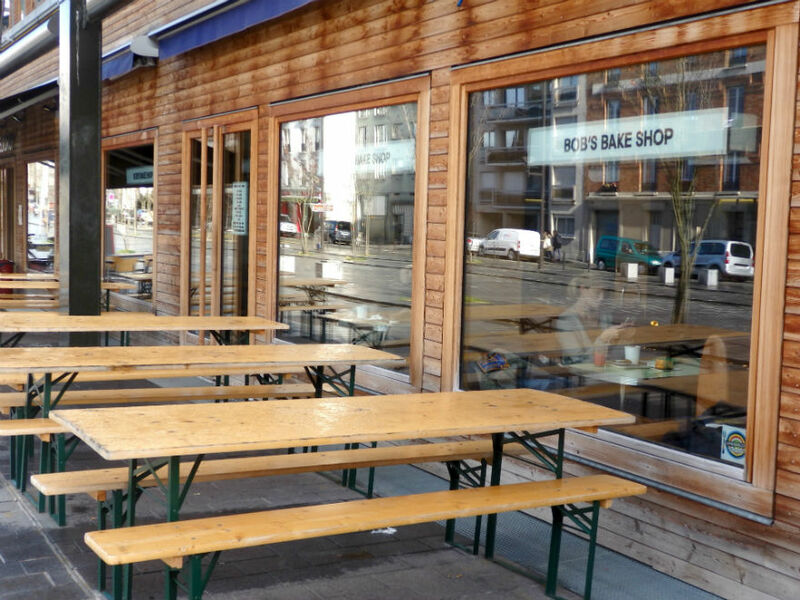 I glanced outside at the rain and imagined how nice it will be in summer to come here and eat in the sun on one of their large wooden picnic tables. My random musings were interrupted by the arrival of my sesame seed bagel. I took a bite and Wow! It was seriously delicious and filled with a generous amount of cream cheese, smoked salmon, sliced tomatoes and pickled red onions. I hadn’t had a bagel sandwich like this in a long time and tried to eat it as elegantly as possible, but I ended up with cream cheese all over my cheeks and fingers (hopefully no one was watching me eat, as I’m sure it must have looked like something similar to the porridge scene in Beauty and the Beast)! 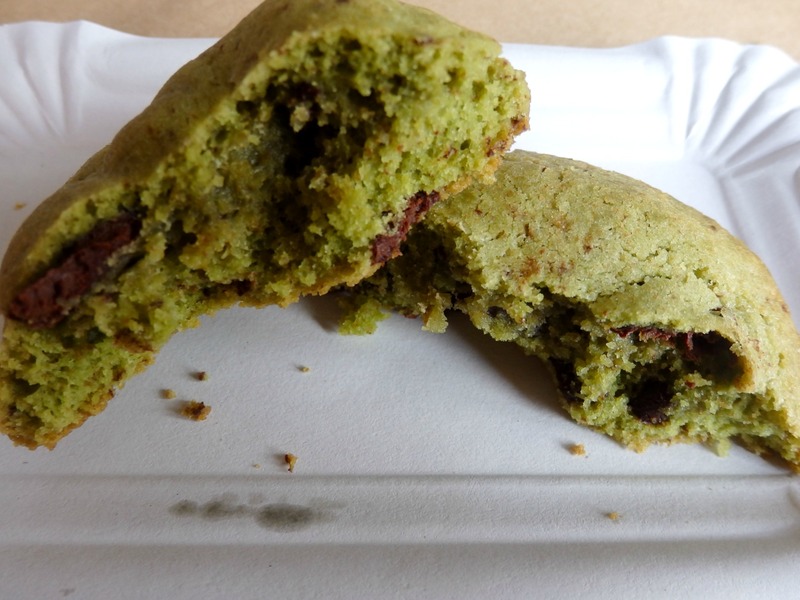 After sipping some refreshing lemonade I moved on to the green colored cookie and was very surprised by how light and crumbly it was, with large chunks of chocolate throughout and a mild taste of matcha. I was pretty full at this point but considered ordering a slice of pecan pie (4 Euros) before leaving. I hesitated for a moment and finally decided I would save that delight for next time…because I’ll definitely be coming back! With a great selection of high quality North American baked goods, I definitely recommend Bob’s Bake Shop. It is bound to please health freaks, or people like me who once in a while feel bad about all of the baguette and fromage they constantly eat and want something a little more wholesome/less fattening! 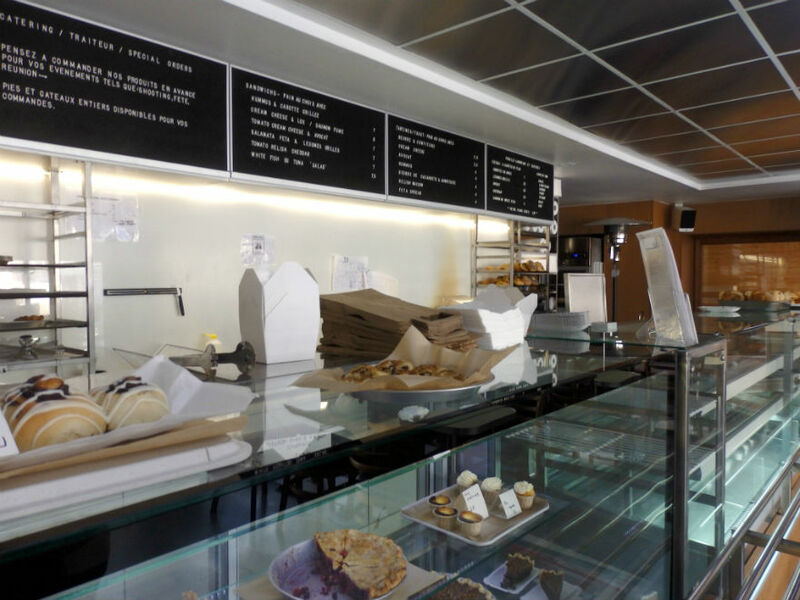 So make your way up to Marx Dormoy métro station in the 18th arrondissement and check out this bake shop as well as Halle Pajol, which has really rejuvenated this often overlooked neighborhood. 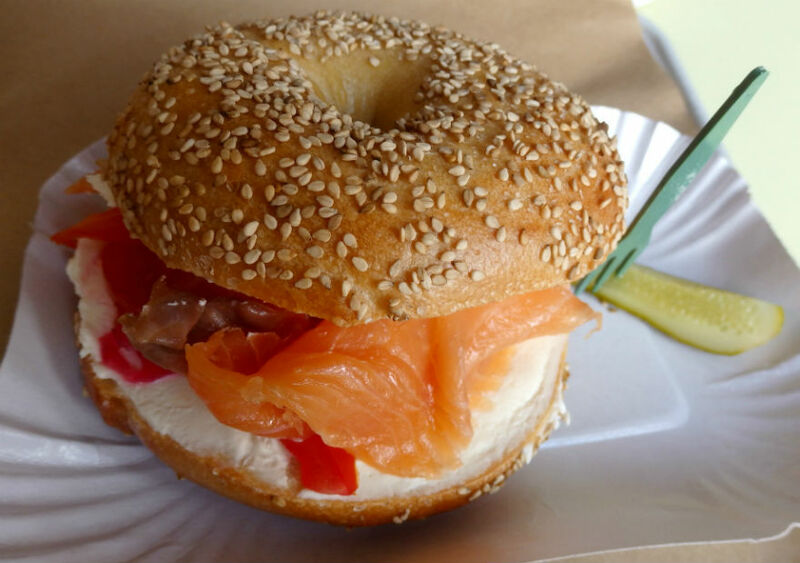 I think I will be dropping by fairly often for my bagel fix from now on! 5 irresistible cookies out of 5! Categories: Uncategorized | Tags: American food, bagels, bakery, coffee, comfort food, cozy, eco-friendly, foodies, hipster, Paris, restaurants | Permalink.